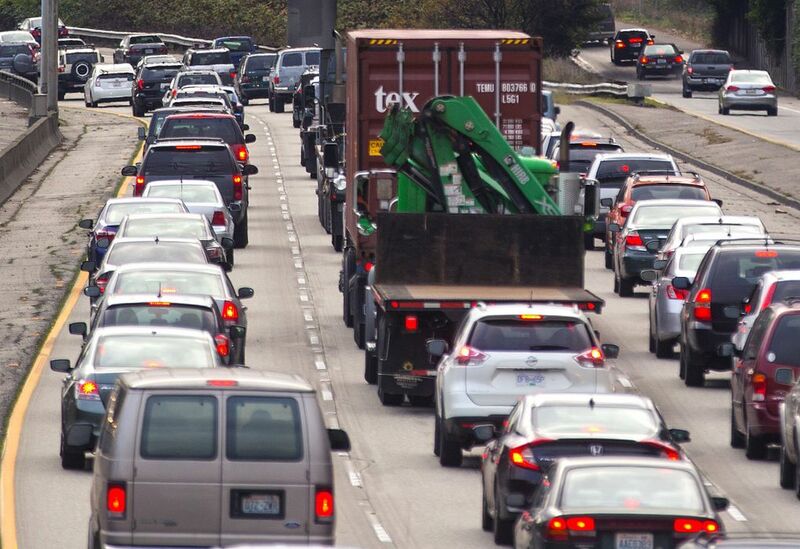 Can’t Washington state ease I-5 traffic? Fixes exist, but most of them are pricey. Plenty can be done to unclog traffic on Interstate 5, but it’s almost all costly in one way or another. Adding lanes, especially through downtown Seattle, is enormously expensive. Adding tolls would reduce traffic, carries its own obvious costs. Even if the city and state wanted to do so, there’s no easy way to widen Interstate 5 through Seattle. The highway’s west side is lined with buildings and businesses, some less than 100 feet from mainline traffic. The east side of the highway is the same, but even more daunting. A half-century ago, when the highway was being built, the uphill neighborhoods, Capitol Hill and First Hill, became unstable, with small landslides threatening to devolve into larger, catastrophic ones. Whole blocks of buildings could have slid into the new I-5 canyon below. The solution: retaining walls on I-5’s east side have steel and cement columns drilled 120 feet deep to hold up the hillside. Those columns are not easily moved. 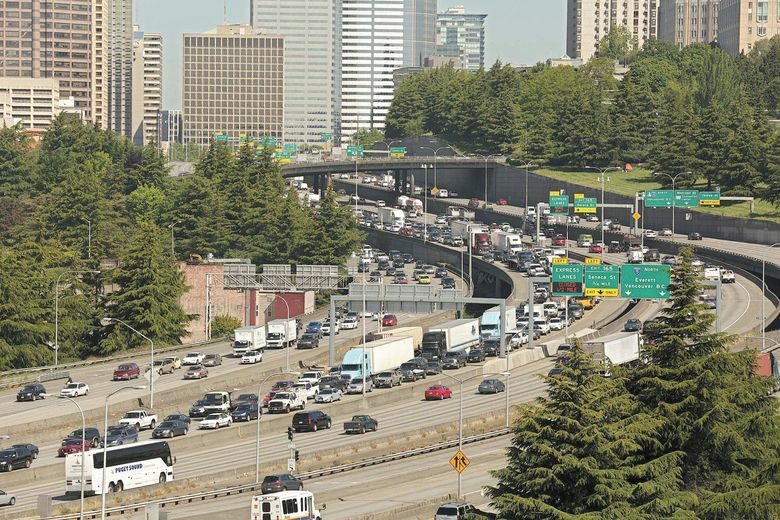 A 2007 WSDOT study outlined dozens of other ideas that could improve traffic flow on I-5 around Seattle. WSDOT could, at little cost, transform I-5’s northbound shoulder between Olive Way and 520 into a transit-only lane. That would reduce evening commute times by an estimated two minutes for the two dozen bus routes that travel that stretch of I-5. Sound Transit 3 will fund studies looking at which parts of I-5 and other highways could accommodate buses on the shoulder. Each day thousands of cars on southbound I-5 — particularly those entering from Northeast 50th and 45th streets — have to do a quick weave left across the width of the highway to access the ramps to Highway 520. Cars entering I-5 south from 520 do the dance in reverse. Shifting the 520 ramps from the left side of the interstate to the right would eliminate congestion caused by this weave and, the study predicted, cut peak travel times from Northgate to downtown by about seven minutes. As I-5 heads north and dips underneath the convention center in downtown Seattle, it cinches its belt and, for not much more than five city blocks, contracts to just two through lanes. Traffic often backs up to Boeing Field, six miles away, according to WSDOT. The problem, it would seem, is that when the state’s busiest road runs underneath a six-story building, there aren’t that many places to put more traffic. But, as it turns out, that’s only part of the problem. There is a plan to add another lane, ameliorating the Seneca Street bottleneck. It’s been floating around as an idea for at least 10 years and final designs were drawn up in 2013. But since then it’s been on hold, lacking about $17 million to carry out. That money is included in the state transportation budget passed in April and work is tentatively scheduled to begin in early 2019. By moving barriers and repainting lane lines, WSDOT will add a third through lane, shifting the current Seneca Street exit-only lane to an HOV through lane. The project will also add ramp meters and new electronic signs, which reduce speed limits when congestion is bad to limit collisions. The changes are expected to reduce travel times by “up to three minutes,” WSDOT says. But no changes to traffic patterns are without consequence. The shift means cars entering I-5 northbound from Cherry Street would have to immediately merge into through traffic, whereas they currently have an open lane ahead of them and plenty of time to merge. That means metered lights on both the collector-distributor onramp and the Cherry Street onramp, and potential backups into downtown surface streets. It’s no mystery why I-5 traffic has gotten worse. The highway’s busiest stretch — just north of Mercer Street — carries about 274,000 vehicles per day. In 1976, the earliest year for which WSDOT has comparable data, it carried about 187,000 vehicles. That’s a lot more cars. The road hasn’t gotten bigger. The most obvious way to reduce traffic on I-5 is to reduce the number of cars on the road. And the most obvious way to do that is to make it more expensive for them to be there. WSDOT has not taken any recent looks at putting tolls on I-5’s general traffic lanes. It did, in 2011, study putting tolls on I-5’s express lanes, which run for seven miles from Northgate to downtown, headed south in the morning and north in the evening. Tolling the express lanes, WSDOT predicted, would generate up to $22 million a year in revenue. It would cause nearly one in four cars that currently use the lanes to switch to the I-5 mainline or another route. Rush-hour travel speeds would increase by up to 17 mph on the express lanes, but decrease by as much as 5 mph on the mainline. In other words, much like I-405’s controversial HOT lanes, commutes would be quicker — for drivers willing to pay. The Legislature has often been willing to add tolls to new roadways, but has been far more reluctant to add them to existing highways. So, for now, there are no plans to toll I-5.